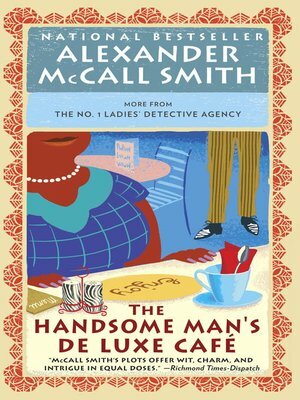 Over the years Mma Ramotswe has found many lost things, but never before has she been asked to help a woman find herself—until now. A kindhearted brother and sister have taken in a nameless woman with no memory of her own history or how she came to Botswana. It falls to Precious Ramotswe and her new co-director, Grace Makutsi, to discover the woman's identity. Meanwhile, motherhood proves to be no obstacle to Mma Makutsi's professional success, as she launches a new enterprise of her own: the Handsome Man's De Luxe Café, a restaurant for Gaborone's most fashionable diners. And next door, Mr. J.L.B. Matekoni is forced to make a choice that will directly affect not only Tlokweng Road Speedy Motors, but the No. 1 Ladies' Detective Agency as well. With sympathy and indefatigable good humor, Mma Ramotswe and her friends see one another through these major changes and discover along the way what true friendship really means.